UPDATE, June 27, 2018: Due to a change in operational schedules, Brazil will not be participating in RIMPAC 2018, but remains interested in a future opportunity to participate in the exercise. Brazil was not slated to participate in the Hawaii portion of RIMPAC. We value our partnership with the Brazilian Navy and look forward to operating with them in the future. 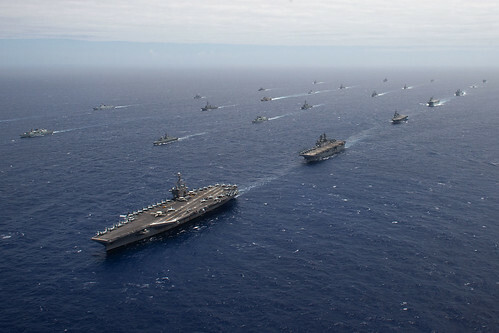 SAN DIEGO - Twenty-six nations, 47 surface ships, five submarines, 18 national land forces, and more than 200 aircraft and 25,000 personnel will participate in the biennial Rim of the Pacific (RIMPAC) exercise scheduled June 27 to Aug. 2, in and around the Hawaiian Islands and Southern California. This is the first time Brazil, Israel, Sri Lanka and Vietnam are participating in RIMPAC. Additional firsts include New Zealand serving as Sea Combat Commander and Chile serving as Combined Force Maritime Component Commander. This is the first time a non-founding RIMPAC nation (Chile) will hold a component commander leadership position. This year will also feature live firing of a Long Range AntiShip Missile (LRASM) from a U.S. Air Force aircraft, surface to ship missiles by the Japan Ground SelfDefense Force, and a Naval Strike Missile (NSM) from a launcher on the back of a Palletized Load System (PLS) by the U.S. Army. This marks the first time a land based unit will participate in the live fire event during RIMPAC. RIMPAC 18 will also include international band engagements and highlight fleet innovation during an Innovation Fair.